*My Monday morning started out walking with not only one, but two dogs. Usually we have Nikki’s dog Butter’s the Poodle with us. But today we also had Clifford, who is Nikki’s granddog. He is a Wirehaired Pointed Griffon. He is a cutie. Having Clifford along for the walk made things a bit more interesting, but but dogs did very well. *We had an early tour bus coming to the mine tour this morning, so I was asked if I could be at work by 8:30 a.m. I said I could, so my day started about an hour earlier at the mine tour office. It was fun visiting with some of the couples on this tour who are from Australia, and they LOVE this part of the country. *It was a slow but steady day at the mine tour. Some new merchandise had arrived, and I worked on it some. I also helped post a job that the Ice Cream Parlor needs someone to work part-time. 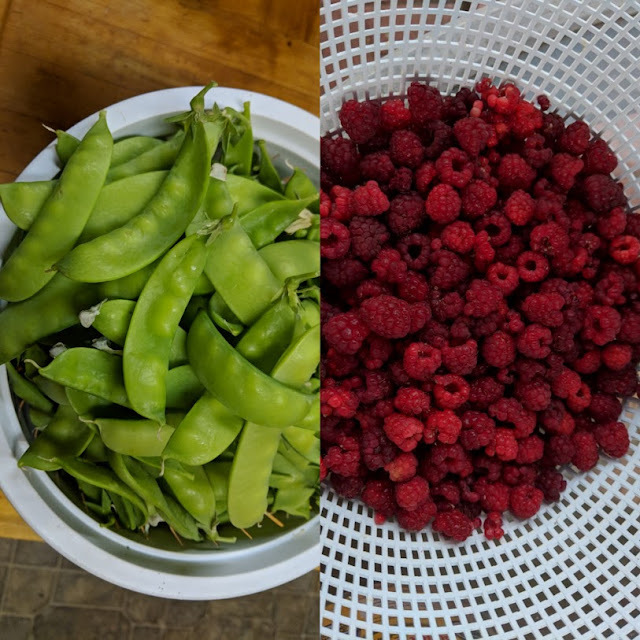 *When I arrived home, I did some hand watering, and then realized there were raspberries to pick as well as peas. The raspberries are going crazy this year!! And I hadn’t really picked any peas, so I got busy picking some. There are still many more to pick another day. This is the best my pea plants have done in many years. *I spent some time out in the cool of the evening reading a new book I picked up at the library today. I really love our Kellogg evenings.